Well, looking at my increasing waistline my hubby at last openly asked me to stay away from stuffing my tummy. Alas… Till now I some how managed to act innocent to all subtle hints I was getting from him. Do you have any idea that you foodies are partially responsible for my increasing waistline? First you lure me with nice description, then tempt me with mouth watering pictures and brainwash me with your sweet guidelines as how easy and quick it is to make. Slit the chilli along one side using small knife. Remove the seeds and white part inside the chilli. If you prefer spicy ones then leave the seeds as they are. Peel the potatoes and chop them into large chunks. Cook them in salted water and mash them thoroughly. Make small balls of mashed potatoes and stuff them tightly inside the chilli and keep them aside. Make thick batter of gram flour, rice flour, cooking soda, chilli powder, turmeric powder, cumin powder, amchur and salt using enough water. Make sure that there are no lumps left in the batter. You can mix about a tbsp of hot oil into the batter which will help to reduce the amount of oil absorbed during deep frying. 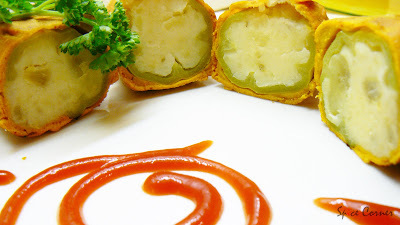 Dip stuffed chillies in batter and coat all the sides. Deep fry them in heated oil till they turn crisp and golden brown in colour. Serve sizzling hot with tomato ketchup or any chutney or dips of your choice. You can add garam masala or any other spices like chilli powder, turmeric powder, amchur, jeera powder etc to mashed potatoes for making it spicier. Add grated cheese or paneer to mashed potatoes for extra richness. 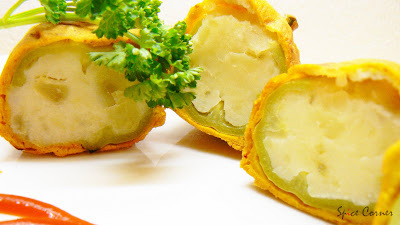 Check for some more delicious stuffed chillies here, here and here. Chillis are loaded with vitamin A, a potent antioxidant and boost to the immune system. As the pods mature and darken, high quantities of vitamin C are gradually replaced with beta carotene and the capsaicin levels are at their highest. Due to these capsaicin levels, some believe that eating chillis may have an extra thermic affect, temporarily speeding up the metabolic rate, hence burning off calories at a faster rate. Whatever, you certainly do sweat and actually cool down in hot climates as sweat evaporates. Your nose runs, your head clears ... you can breathe! And with that extra flow of saliva, the gastric juices also flow. The alkaloids from the capsaicin stimulate the action of stomach and intestine improving the whole digestion process! Too much, girl! :) You've gotten artistic as well, love your saucy sun! anyways so I am not alone. Looks mouthwatering,save the authentic Karnataka recipes for me for Sept,I am hosting RCI for Karantaka cuisine!! Stuffed Chillies looks creative and interesting dish too..
dont make me feel guilty:( K too asks me why i am stuffing each and every veggies on sight;) he he he..
hey, i won't even be able to manage that - your sun is just fine! Thats just simply gorgeous,,, we are ready for your revenge, atleast we get to see delicious recipes with beautfiul presentation...the saucy sun looks amazing ..
hey girl...is this what you were gonna make for K when we were chatting? hehhe....what a woman! Yeah, i think almost everyone of us have grown a little sideways lately....kya karein? Khao ,piyo, aur jiyo, i say. ah!!! so i did accomplish my goal;) thank u dear for ur compliments:) ur japanese eggplant rolls are still fresh in my mind!!! gorgeous pic..
hello stuff master, i mean in the filed of veg!! u r too cute! btw, every time i see any stuff veg i remember a quote from bill maher, the comedian. He said during thanksgiving - 'this is the only country that stuffs food in side food', little does he know about our desi stuffing, we stuff everything. ha!ha! anyway just a little joke wanted to share with you. Oh no, that sun looks so naughty in a waistline-expanding way!!! :) Aren't the chillis hot enough to be eaten on their own? Sheesh, yours look ten times better than the greasy ones I made last week! My hubby would never dare tell me my waistline's expanding because his is no better, heh heh! Ooooo these stuffed chillies look so good, I want to eat it right off the blog :) :) Great recipe and a wonderful presentation. Sia, Artistic design with the ketchup there! Are you stuffing all those veggies in the fridge? Love those extra Gyan you supply with every recipes. I'd luv some of those chillies!! I can almost taste it:) Nice presentation and ketchup design. Looks like you got lots of free time:). 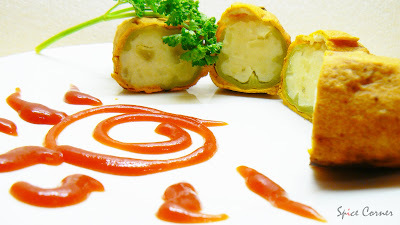 Nice presentation and delicious recipe. So you're blaming us? Go on, we can take it. I know you want to stuff another vegetable, don't deny yourself, just do it. :)) You can always keep blaming us. wow stuffed chillies..looks mouth watery!!! Oh girl!! you and your stuffed food are making my mouth water. By the way which of these stuffed food did you like the best. Let me start with the best first ;-) hee hee . Loved the ketchup sun. hmm stuffed chillies, lovely presentation as ever. Stuffed chillies nodi bayali neeru...hmm . u r a darling girl:) he he he... so u dont mind me blaming u guys? enri? nimma aduge maneli en nadita ide? sanje barabahuda? And i like u're write-up, it was funny! Oooooh! Nange idanna nodi nan laptop na haridu thin beku anisthu :) It looks sooo appetizing! Hot is good! love this recipe. 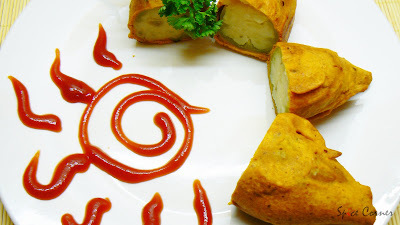 i usualy make them with paneer, but have to try with potato-cuz' i love potatoes :). You have a fantastic skill in food styling! First time here. I came to you from Asha's "foodie's hope" blog. Glad I found you. Good collection of recipes and awesome presentations. Nice inspirations for my next party.Very artistic pictures. Good work. Yum sia. They look gorgeous. I have been known to buy stuffed chillies from my favourite London sweet shop. These look almost identical. I have a very simple solution to ur "increasing waistline"..Send all those stuffed stuffies here:))..Very nice recipe..Esp. liked the design u made with the ketchup..Go and hit the gym, girl..and keep making all these wonderful dishes..
Hi Supriya, I definitely have to take a little time away from stuffing myself these days, but I don't think I can do it before I try these and your mushrooms... oh my goodness!!! The photos are gorgeous as usual, and they both sound soooo delicious :) I especially like the 'flame' garnish for the chiles... so clever! 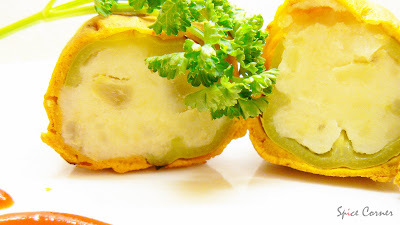 Hmm Stufed jalapenos are decadent, my mouth is watering!I had th ebest of these in JAipur! i never tried chillies with paneer although i use grated paneer for tomatoes and capsicum stuffing. a warm welcome to spice corner dear:) i am glad to get ur feedback:) hope u will visit again. sia, Gracious ,what a rhyming, stuffing tummy with stuffed stuffs, guess, now I'm doing the same, stuffing all the delightful food pictures ,a visual stuffing :) Stuffed chilli is my fav,do go to any distance to indulge my craving for these. And Oh... another thing... since u mention waistlines.... it IS difficult to resist ! I FAIL every time I resolve to diet... my hubby just shakes head and is content with a few sarcastic remarks.... water off a duck's back!!hehehehe!! Please see my version here. Simba loved seeing all the photos. Quite delicious photos indeed. Good work! Keep up! Usually Simba run out of food options and end up doing few dishes repeatedly. Simba hopes that he can come back to this site and pick some recipes. Simba particularly liked the way this site is organized! Nice work!! I tried the stuffed chilli recipe this week and turned out great.Have posted in my blog and ending it back to you for MBP. 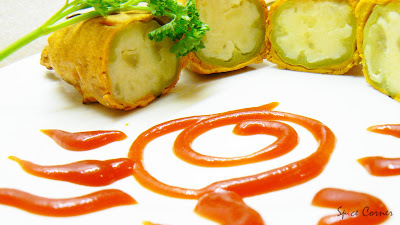 Hey wat is the pepper u have used.Is it Capsicum(Kodamilaga) or the Bajji Chilli(Long, green one). Hey the chilli u used is capsicum? These are banana peppers we get in indian stores not capsicums. you can either cut them in middle and stuff and then cover with batter and deep fry or slit vertically from top-bottom, then stuff and cover with batter and deep fry and then cut in center. you can also use capsicums if desired.